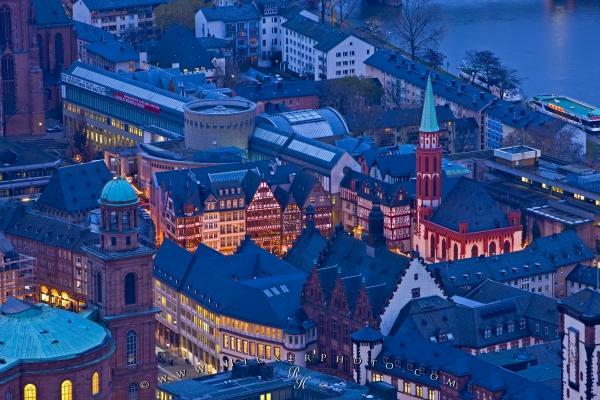 An aerial view of the Roemerberg at dusk, which is the City Hall Square in the City of Frankfurt in Germany shows the architecture and design of an old town perfectly. The buildings are clustered around the main square. This aerial view shows the Roemerberg, the City Hall Square located in the historic centre in the City of Frankfurt am Main, which is in the Hessen region of Germany. From this aerial view at dusk, you can see the buildings located very close together all clustered around the main square. Photo of the Roemerberg (City Hall Square) at dusk in the City of Frankfurt am Main, Hessen, Germany. One of the most popular attractions in the Roemerberg is the Roemer building, which has been the City Hall for Frankfurt for over 600 years. There is also the Justice Fountain located in the center, although it cannot be seen from this view. The Roemerberg was heavily damaged during the Second World War and it took a number of years to rebuild it. Reconstruction was finally completed in 1986 and now the Square includes a Kulturschirn, which is a leisure and cultural zone for residents and tourists. Roemerberg (City Hall Square) in the historic centre in the City of Frankfurt am Main, Hessen, Germany, Europe. I photographed this photo with the digital SLR camera model Canon EOS-1Ds Mark III, aperture of f/11.0, exposure time of 5/1 sec. on ISO 50, as always I used a original Canon Lens, the focus lenght for this picture was 200mm.